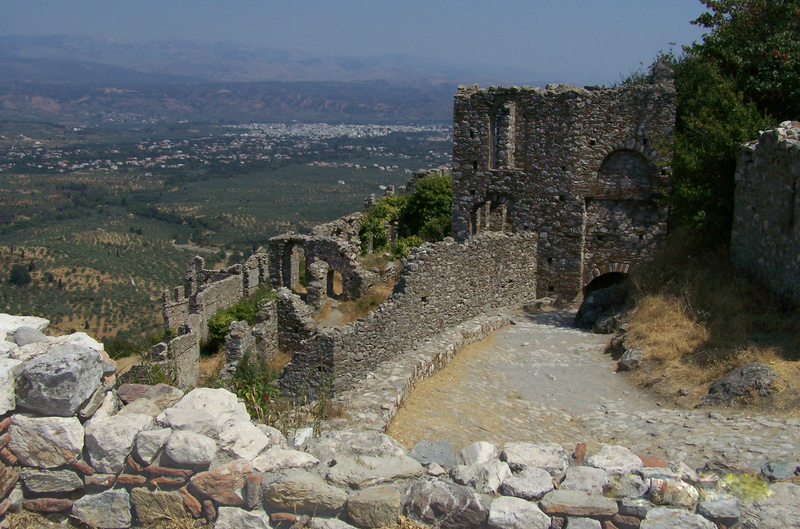 Mystras is sited on a steep hill on the north slopes of Mount Taygetos, 6km from Sparta. 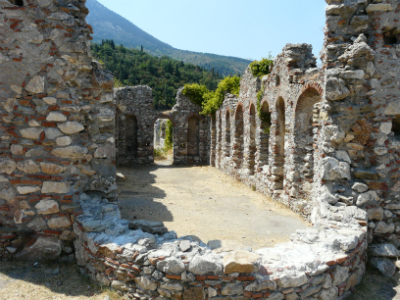 This remarkably intact Byzantine town is one of the most exciting historic sites in the Peloponnese which once had a population of about 20,000. 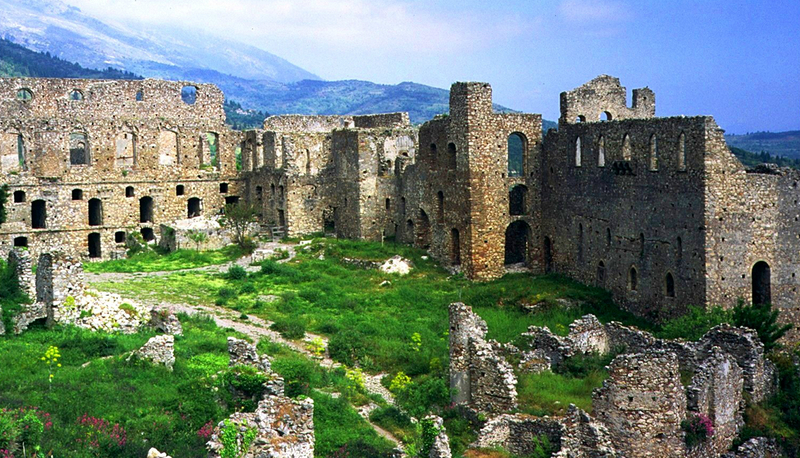 Mystras, the best preserved example of a medieval walled town in the Greek region, is today a standing ghost city that fascinates the modern traveler with its castle, churches and the palatial complex of the ruling Byzantine dynasty, bearing witness to its bygone greatness. Private houses and mansions still standing today provide a rare source of information for the domestic architecture and urban planning of the late Medieval period. Mystras became in the mid-14th century the capital of the Peloponnese and the seat of the Despotate of the Moreas, with a ruler or despot who enjoyed a tenure for life. 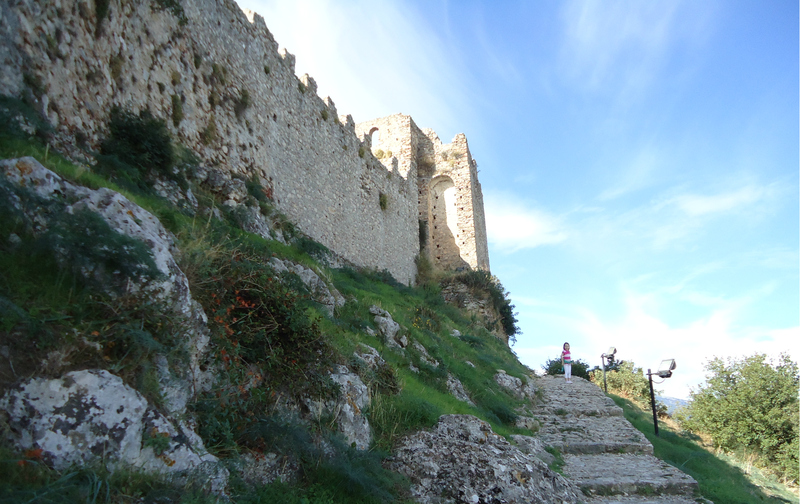 The castle was built in 1249 by Guillaume II de Villehardouin, fourth Frankish prince of the Moreas, one of three fortresses (the others at Monemvasia and the Mani) designed to garrison his kingdom. It has two yards, with a gate for each. In the outer yard is a sturdy circular tower, a cistern and the ruins of buildings dating from the years of Turkish occupation. In the inner yard is the abandoned residence of the governor, a cistern, a circular tower and a small church, perhaps the oldest edifice in Mystras. 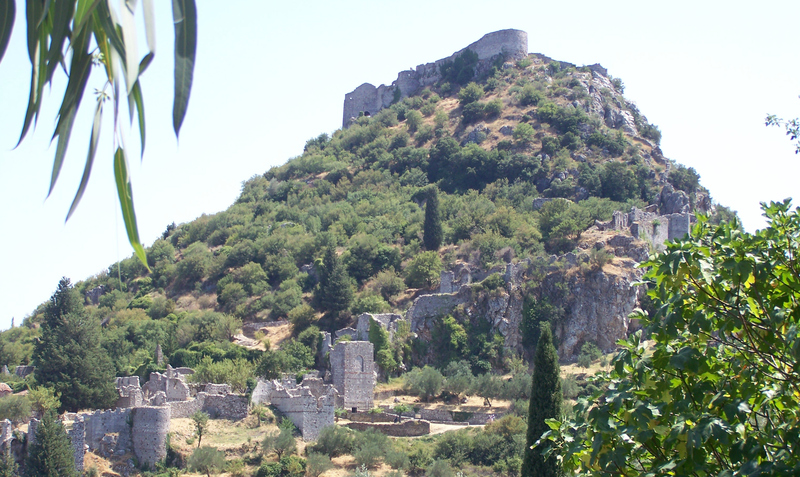 In 1262 the Franks were driven out of Mystras by the Byzantines and by the mid-fourteenth century became the Despotate of Mystra. This was the last province of the Greek Byzantine empire and became its virtual capital. 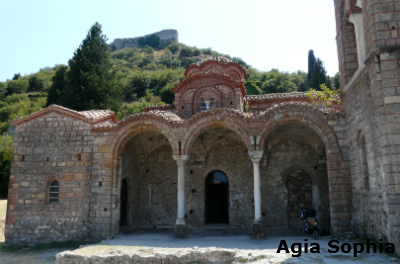 In 1448 the last emperor of Byzantium, Constantine XI Palaeologos, was crowned at Mystras. In 1460 the hill was captured by the Turks and in 1464 Sigismondo Malatesta of Rimini managed to capture the city but not the castle. 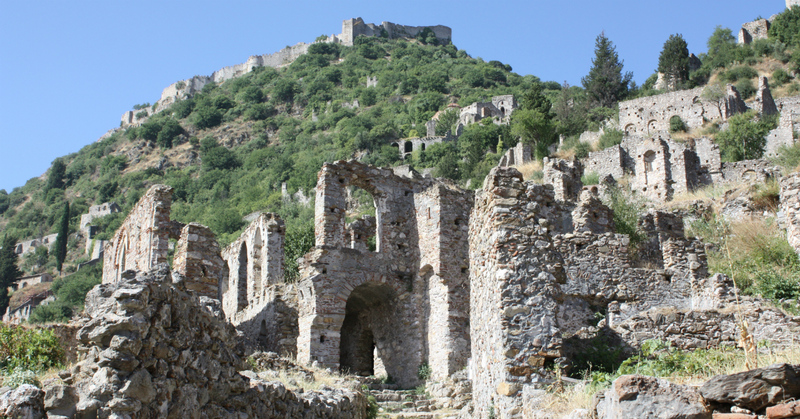 For a short time Mystras was under the control of the Venetians (1687-1715) but was again taken over by the Turks until it was one of the first castles of Greece to be liberated in 1821. The founding of modern Sparta by King Otto in 1834 marked the end of the old town's life. The site was evacuated after fires in 1770 and 1825. 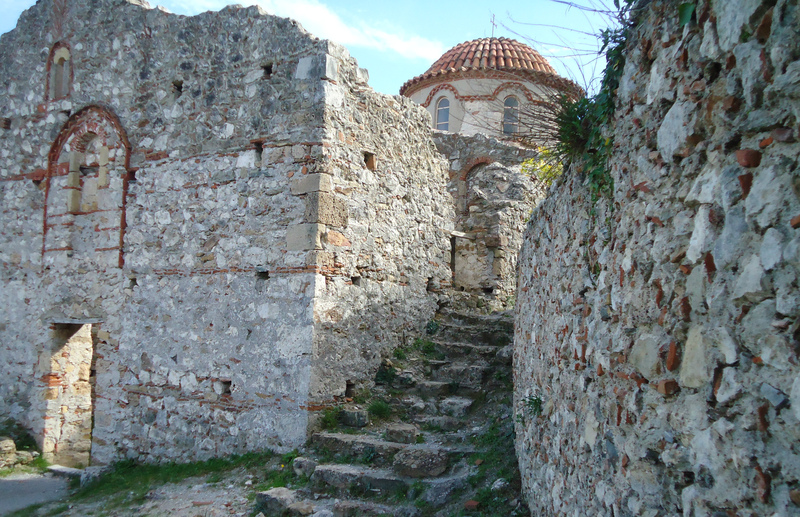 Mystras had three gates: the fortified Gate in the outer wall, now the main entrance for visitors; at the point where the road ends is the Upper Gate, called the Fortress Gate and the Gate of Nafplio, high up on the northern side of the inner wall, fortified with square and circular towers and with an iron portal that could be lowered and lifted. Internal communication between Kato and Ano Hora was through the Gate of Monemvasia, also known as Sideroporta, the Iron Gate. Restoration work started at the beginning of the 20th century was disrupted by civil war. The Castle reached by a long climb direct from the upper gate, keeps the Frankish design of its original 13th century build. There is a walkway around most of the keep and with 360 panorama view from the very top it is worth the climb. The castle itself was the court of Guillaume II de Villehardouin but in later years it was used mainly as a citadel. The two strongly fortified circuit walls were strengthened by tall, rectangular towers, dated to the Late Byzantine period. 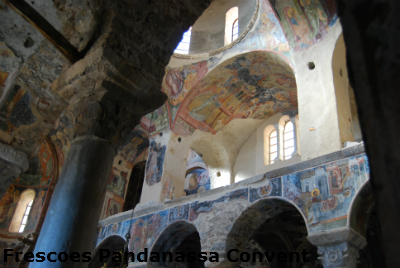 The Church of Agia Sophia (Holy Wisdom) is a domed, cross-in-square, two-column church, built in1350. It has side chapels and a bell-tower. The floor is made from polychrome marble. 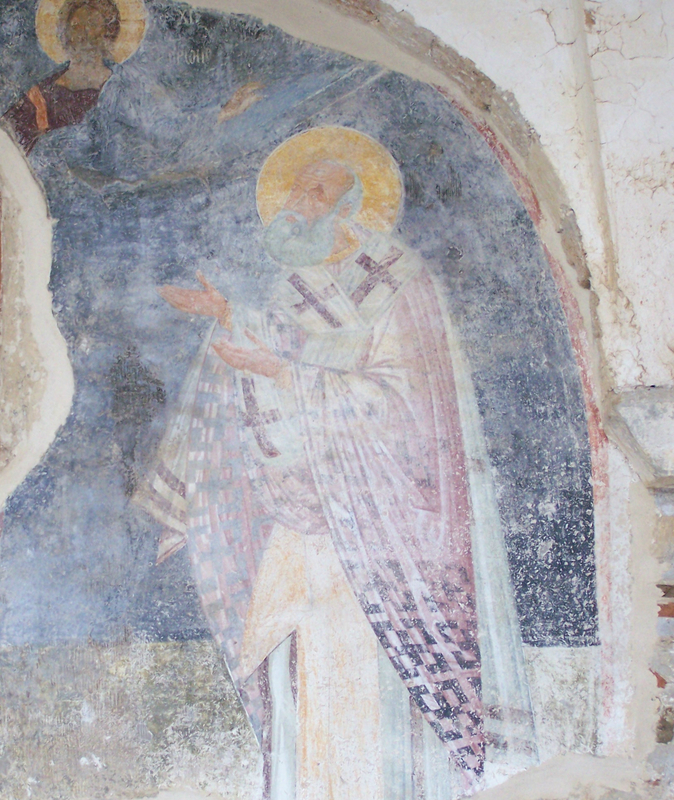 Remarkable wall paintings are preserved in the sanctuary and the chapels. 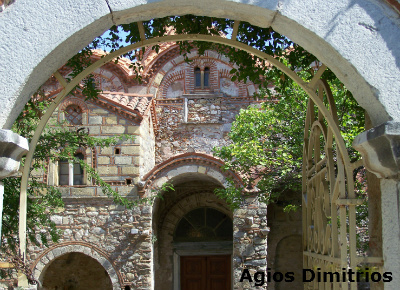 The Church of Agios Theodore was built between 1290 and 1295 by the monks Daniel and Pachomios. It is in the shapre of an octagon with wall paintings from the end of the 13th century. The Church of Our Lady Hodegetria (the Leader of the Way), was built in 1310 by Abbot Pachomios. It belongs to the mixed architectural type with a narthex and lateral chapels and is decorated with excellent wall paintings, dated 1312-1322. The Church of Our Lady Evangelistria (of the Annunciation) is a domed, cross-in-square, two-column church decorated with wall paintings from the start of the 15th century. The tiny Perivleptos monastery built in 1310, is a single-domed church, partially carved out of the rock. It contains Mystra's most complete cycle of frescoes, almost all of which date from the fourteenth century. 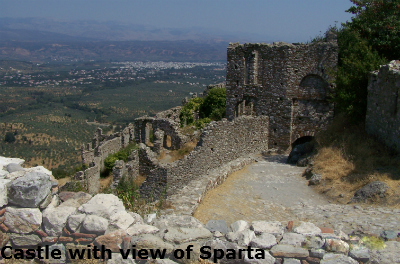 In 1834, the new Greek King Otto founded the new city of Sparta and the population moved gradually there. The place was abandoned. 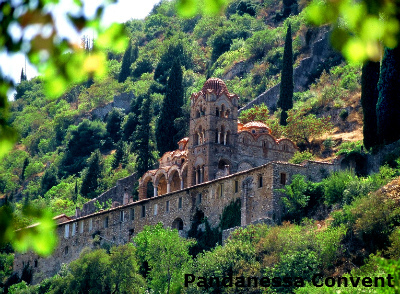 In 1921, Mystras was oficially declared an outstanding Byzantine monument. The last inhabitants were forced to leave in 1953. Photograph coutesy of Manuel Herrero on Flickr. 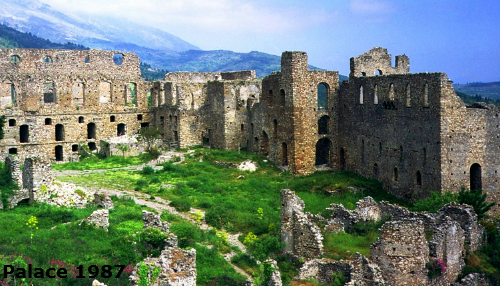 When excavations were resumed in 1952, the last thirty or so families who still lived in the lower town were moved out to New Mystras. Only the nuns of the Pandanassa (Queen of the World) convent have remained; they have a reception room where they sell their own handicrafts. 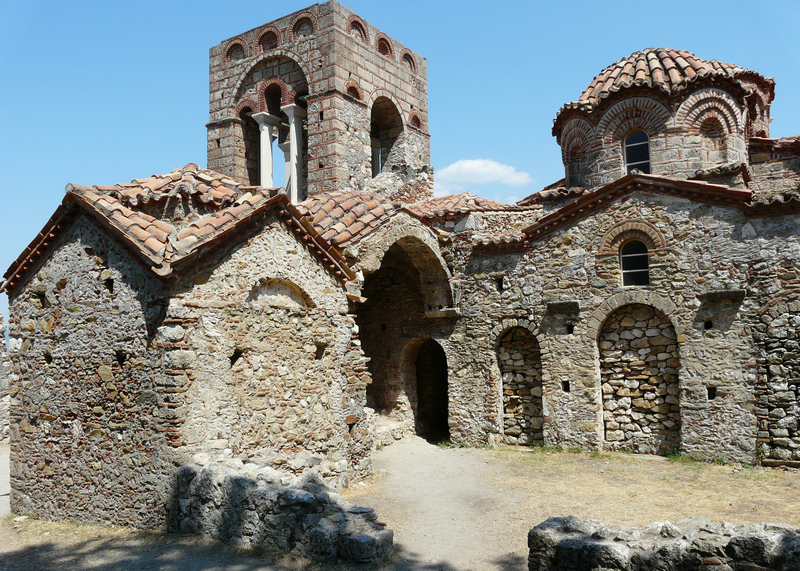 The convent's church, built in 1428, is perhaps the finest surviving in Mystra, perfectly proportioned in its blend of Byzantine and Gothic. The frescoes date from various centuries, with some superb fifteenth-century work. Other frescoes were painted between 1687 and 1715, when Mystra was held by the Venetians. The main church belongs to a mixed architectural type and has exterior porticoes and a bell tower. Fine wall paintings dated to around 1430 are preserved on the upper floor and in the sanctuary, while the wall paintings on the ground floor date from the 18th century. Along the path leading from Perivleptos to the lower gate are two small renovated churches, and, just above them, the Laskaris House, a mansion thought to have belonged to relatives of the emperors. Like the House of Frangopoulos, it is balconied; its ground floor was probably stables. The Cathedral of St. Demetrios has mixed architechture: it is a three-aisled basilica on the ground floor with a narthex and a bell tower (dated to the later half of the 13th century), and a cross-in-square church on the upper floor (added at the beginning of the 15th century). The interior is decorated with wall paintings representing many different styles, dated to the period between 1270/80 and the first quarter of the 14th century. 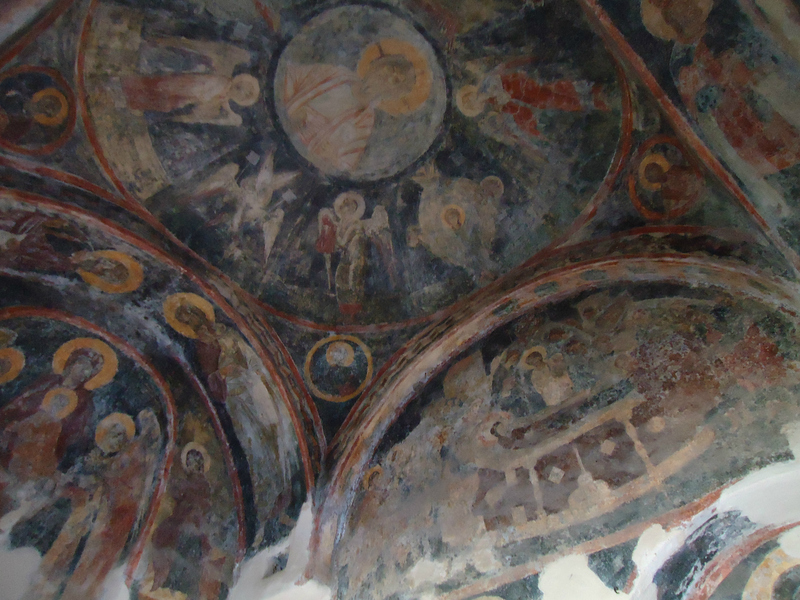 The wall paintings of the dome date to the 15th century. 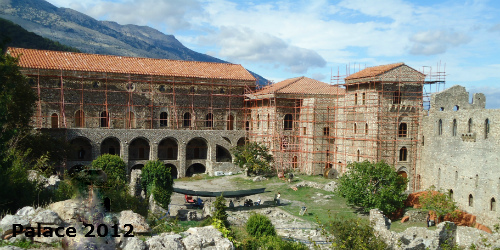 The vast, multistoreyed, L shaped complex of the Despots' Palace built between 1249 and 1400 is undergoing extensive rebuilding and restoration). The palaces of the despots of Morea are the most extensive ruins of Byzantine civic architecture in Europe. The complex is laid out around a vast square, the only one in town. In Byzantine times, the square was the place of all public ceremonies, whereas during Ottoman rule it was used as a market.Most prominent among its numerous rooms is a great vaulted audience hall, built at right angles to the line of the building; its highly decorated windows dominate the skyline It was once heated by eight great fireplaces. The palace is currently not open to the public as extensive restorations are still ongoing. The Vrondohion monastery, a short way uphill, was the centre of cultural and intellectual life in the fifteenth-century town, the cells of the monastery can still be discerned. It was also the burial place of the despots. 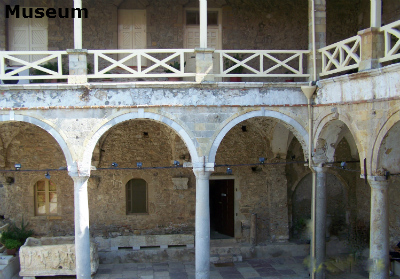 The museum of Mystras is sited in the two-storey building at the west wing of the north courtyard of the Cathedral of Agios Demetrios. It was founded in 1951 and since then its collections have grown considerably. It is well worth a visit. 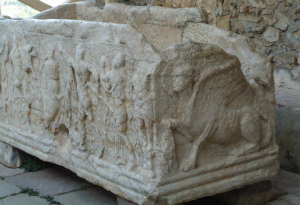 It contains collections of Byzantine sculpture, jewellery, pottery, coins, fragments of wall paintings, portable post-Byzantine icons, and pieces of fabric. 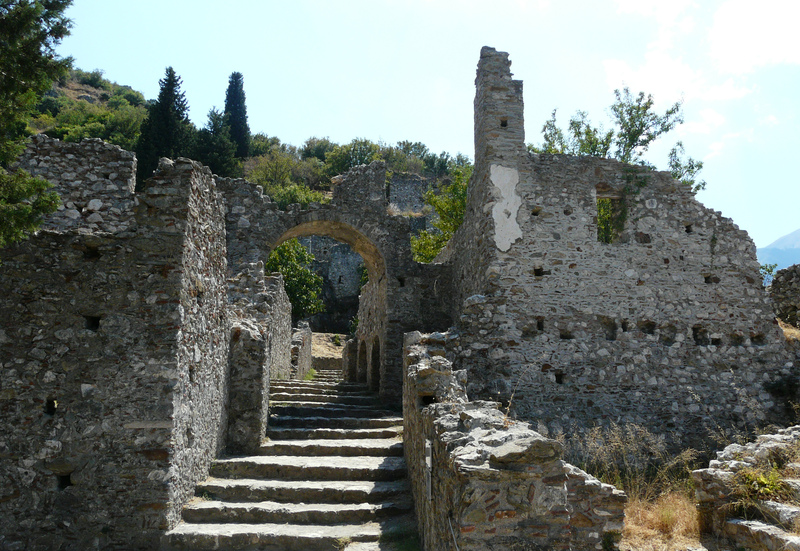 History and daily life in Mystras comes to life in the old alleyways and its mansions and houses. Old or more recent, most have retained their initial form and constitute a valuable source of information regarding architecture, the manner of construction and daily life in the 13th century and later. There are more than 25 churches with their architecture and history which add to the special character of Mystras. When visiting Mystras you need at least 4+ hours. It is best to drive up to the top gate (the Fortress Gate) and start from there. If you visit in the summer months it is better to be there in the early morning, with good walking shoes, a hat and water. I have visited in August and November and the later visit was much better. From the top entrance the climb to the castle is quite strenuous but the ruins and the views from the top are well worth the effort. From the top gradually work your way down through the town. About half-way down one or our party went back up to the top and took the car down to the lower gate and then met us as we walked down. The walking over stone is quite difficult at times and you seem to be looking at your feet a lot of the time. Mystras is a wonderful place to visit, the ruins and the churches bring to life the town as it was in the past and when the Palace reopens to the public that will be a sight to behold!